Armed with the motto of Prepare, Not Repair, Akshara's Balwadi programme gives underprivileged children in the age group of 3-6 years the foundation required to enjoy a good education. “The early years of a child’s life last a lifetime” – these were the opening remarks made at a colloquium in December 2010 hosted by Akshara Foundation in Bangalore by Dr. Venita Kaul Professor and Head of CEECD at the Ambedkar University, New Delhi. And it is because of this importance that due care and emphasis has to be placed on Early Childhood Care and Education (ECCE). While ECCE covers a range of domains such as education, health and nutrition, at Akshara Foundation, the focus has been on issues concerning Early Childhood Education. To be more specific, Akshara has over the past years focused on education for children between the ages of 3-6 years in their pre-school programme. The programme is called Prepare Not Repair and this effort has created enabling and stimulating environments for children to grow and address their development and educational needs in an integrated manner. Since its inception in March 2000, Akshara has impacted the lives of over 150,000 children in the pre-school age groups. The Prepare Not Repair programme has been developed by Akshara Foundation to offer quality pre-school education through the government’s ICDS (Integrated Child Development Services) network. The anganwadi worker is responsible for delivering a large number of services in the community. With so many responsibilities, it was found that the structured learning activities for pre-schoolers was not given due importance. Akshara worked closely with the state government, and started this as a city-wide programme in Bangalore in 2009. The programme is based on Akshara’s long experience facilitating independent pre-primary centres (called ‘balwadis’) over the previous decade. Over the years since inception, it involved the nurturing of independent balwadis, the training of anganwadi workers, the provision of teaching and learning materials for anganwadis and balwadis, and the creation of a support and monitoring system to assist anganwadis and balwadis and track the performance of children. The longer term objective of this effort is to ensure universal enrolment to primary schools and that children benefit from their early years of schooling – something that will serve them their entire lives. 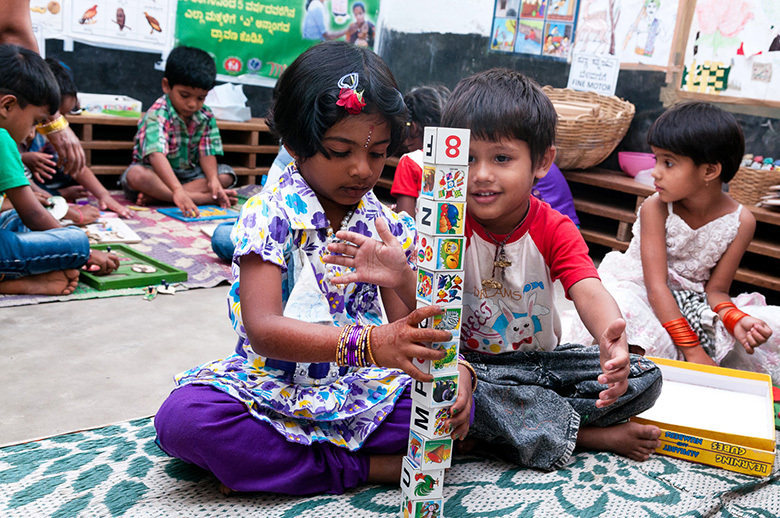 To achieve this, Akshara focuses on imparting school-readiness skills - through joyful learning. Akshara's pre - school education strategy is based on a practical and scientific design.The focus of this is to put a ‘structured’ pre-school programme in place with key inputs of high quality Teaching Learning Material (TLM) and capacity building of teachers. The robust training component is supported with a well-designed; research based pre - school kit for supporting development across multiple domains of development for early childhood. The programme also has a monitoring component as well as a commitment to community engagement through the activation of Bal Vikas Samithis, community support mechanisms for anganwadis. Visit our Resources section for more information on the Prepare Not Repair TLM Kit and manuals. Ask five year old Navin, a willing child with large intelligent eyes, what he feels about all this material and he says, “Happiness.” He has been in the anganwadi for 3 years and knew a few rhymes and attempted the initiate’s first steps in writing. Since Akshara’s inception in 2000, the Prepare Not Repair programme has left a significant impact on the 150,000 children it has reached. Anganwadi workers were given new purpose as they discovered a variety of practical and effective solutions for teaching and time management. The programme showcases the importance of quality teaching-learning material as a vital instrument of pre-school education. It has motivated the ICDS to rethink their stand on the issue and today, the ICDS supplies updated material to all anganwadis. Community support groups like Bal Vikas Samithis and Friends of Anganwadis, which were failing or non-functional, were given new life.